Investing in energy-efficient windows is one of the best ways to add long-term value to your home and decrease monthly energy costs. Before moving forward with new windows, it is helpful to know how they work and what options are available. Acadia Windows & Doors is here to break down the basics and help decide if new, energy-efficient windows are right for you. Double- and triple-paned windows have become increasingly popular over the last few years. 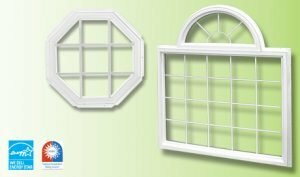 Although single-paned windows are not often used anymore, they are the most inexpensive window option available. They are commonly used for garages, sheds and other structures requiring less insulation or security. Double- and triple-paned windows, also known as Insulated Glass Units (IGUs), are windows with multiple panes of glass, surrounded by an insulating layer of air or clear, odorless gas, like argon or krypton. These windows are far more efficient than single-paned windows, keeping hot air in during the winter and preventing cool air from escaping during the summer. The Low-E coating found on many multi-paned windows further cuts down on energy costs by blocking harmful UV rays from heating up the interior of the home. To help maximize your investment, you will want to focus your search on the double- and triple-paned window options when in the market for new, energy efficient windows. Not just any window can be deemed energy efficient. The National Fenestration Rating Council (NFRC) operates a voluntary program that tests, certifies and labels windows, doors and more for their performance rating by measurements known as the U-factor and heat gain coefficient rating. U-factor is the rate at which a window conducts non-solar heat flow. The lower the U-factor, the more energy efficient that product is. For example, high-performance, double-pane windows can have U-factors of 0.30 or lower, while some triple-pane windows can achieve U-factors as low as 0.15. Solar heat gain coefficient (SHGC) is the amount of solar radiation admitted through a window, which is subsequently released as heat inside a home. Windows with a high SHGC rating are more effective at collecting solar heat during the winter, while those with a low SHGC rating are more effective at reducing cooling loads during the summer by blocking heat gain from the sun. Because the NFRC rating is inclusive of the whole window–including the frame–an energy efficient SHGC rating is generally below 0.8. When you are selecting energy efficient windows, keep in mind that the types of windows which successfully pass the NFRC’s tests include the ENERGY STAR label. Consider the amount of sunlight your home typically receives and be sure to ask about the U-factor and SHGC rating before making your decision. How Much Value Do Energy Efficient Windows Add? The biggest reason that high-efficiency windows have become the market standard is their ability to ultimately save homeowners’ money. According to ENERGY STAR, a typical home can save up to $465 a year when replacing single-pane windows, and up to $111 when replacing double-pane, clear glass windows. 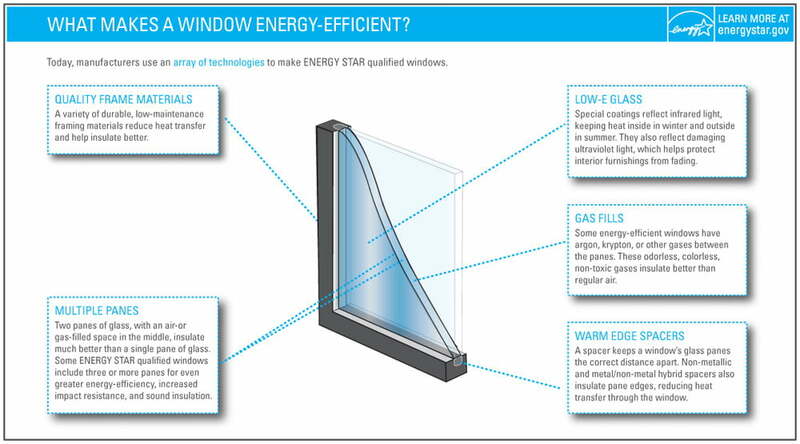 Anatomy of an Energy-Efficient Window, source: ENERGY STAR. Besides the monthly savings on energy costs, replacing your old, drafty windows adds value to your home in the long run. Homeowners can typically expect to recoup the cost of purchasing and installing new windows by increasing the asking price when it comes times to sell the home. According to Zillow, energy-efficient windows can create a return on investment of over 100%, meaning you can potentially profit from the purchase of new windows. Acadia Windows & Doors has been producing, manufacturing and selling quality windows since 1947. Our customer-focused mindset means that we are committed to pairing you with the right windows and on the right budget. Our full line of ENERGY STAR certified windows is designed not only to maximize efficiency but to enhance your home’s look from inside and out. Get in touch with us today to learn more about our selection.